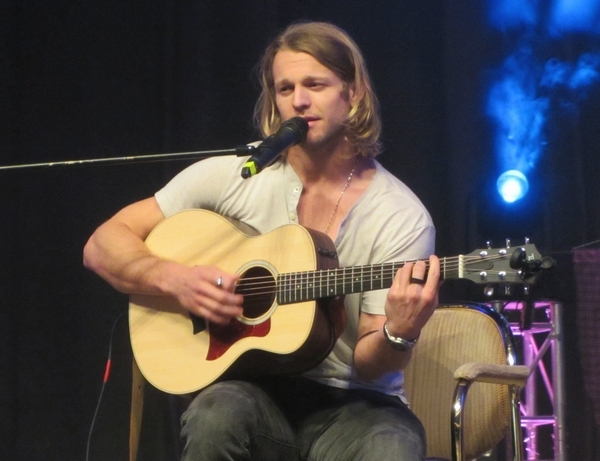 I really had intended to write this final post about RingCon in general much sooner. But somehow I never got around to actually write it. Either I didn’t feel in the right mood or I was too busy or too tired or most probably a combination of all three. But – to no surprise – the longer I let this post linger, the less I actually remember about RingCon weekend or feel important enough to try to recall now. To me it was all about Outlander and Sam after all. Instead of avoiding to rack my brain and procrastinate writing this final post, I just go ahead and write down the few things my mind seemed to think were worth remembering, now three four weeks later. Besides the Outlander posse *g* RingCon had quite a few other guests, actors from popular shows, which I don’t watch, like “Game of Thrones” or haven’t watched like “Buffy”. I caught the occassional panel with some of them and most of the time they were entertaining enough to keep me in the auditorium. At least if I wasn’t standing in line for something Outlander-related or was grabbing a bite to eat or a coffee or just needed to catch a break from all the hustle of hundreds to people milling around. I think the huge mass of people everywhere all the time was what stressed me out a bit some of the time. But the weather was lovely for early November so I often just grabbed a coffee and went outside and found a quiter place to just be for a few moments. I think the “stress” was partially also caused by the whole “OMG! Sam! Outlander! Everything!” excitement and nervousness. But back to the other RingCon guests. Like I said, I wasn’t all that interested in GoT or Buffy guests, so I didn’t see a lot (or nothing at all) of Sarah Hagan (Buffy), Finn Jones, Gemma Whelan, Amrita Acharia (all GoT), until the closing ceremony. When Sarah spoke a few words, I realized I knew that voice and of course her, from her one-episode role on Grey’s Anatomy season 1 (she played the orthodox Jewish girl who needed a new heart valve). Television is a small world after all, isn’t it? For the lack of alternative I somehow watched both panels with Carice van Houten (GoT). To me she seemed a bit distraced during her first stint on Saturday. On Sunday she was more open and entertaining, but the entertainment value came more or less involuntarily. She seemed to have no clue really about the Lord of the Rings / Hobbit franchise or the books. She mixed up plots and characters and actors from this and the Harry Potter franchise and had the audience roaring with laughter. But I don’t know if that was her intention. When Mark incredously asked her if she hadn’t watched the movies, she replied with something like “I did. But maybe I was stoned? I’m from Amsterdam!” Yeah, her panels were entertaining, but also very weird. 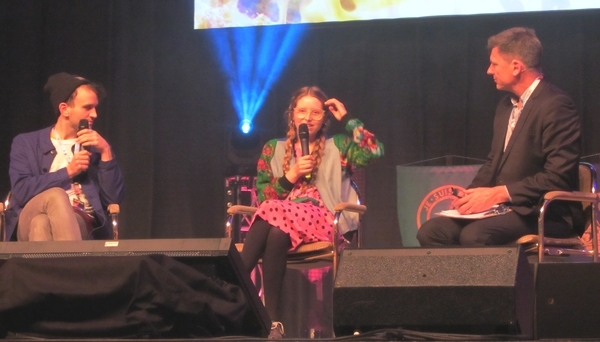 I watched the full panel with the two Harry Potter actors, Harry Melling, who played Harry’s cousin Dudley and Jessie Cave, who played Lavender Brown. Chase Coleman from “The Originals” was a pretty cool guest as well. I caught part of his panels or performances, because he’s not just an actor, but also a musician and he played and sung a few songs for us. Cover versions of classic rock songs or modern ones and it was fun! It seems like every other male guest was asked about Outlander as well, either from Mark who was doing the interviews or from someone in the audience. Turns out Chase has Scottish ancestery and he claimed to even own three kilts! He also dropped a convincing “Aye” into the conversations about Outlander/Scotland, so that was nice. Besides the Outlander guests, he definitely was my favourite. He was entertaining and interesting and he answered openly to every question. He was funny, he was sweet, he was just amazing. He was also quite “hyper”, and spent his panel walking around the auditorium, getting up close and personal to the fans at the microphone or anywhere else. It was such a joy to watch. At the opening ceremony he was introduced before Diana, so they ended up standing next to each other and he immediately chatted up to her. What a flirt! The most memorable moment happened outside of the official program though. During his panel Liam was asked how he feels about not looking as as bulky as he did during filming Spartacus. One of the friends who was staying at the Con hotel saw him at the gym later that night, and they joked that he obviously took that question to heart :-) I only later learned about that, because I was in the line for my photo with Sam. I was scheduled to meet my friends at their room on the 5th floor (close to the elevator) when I was done. The hotel elevators can only be operated via room key cards, so I texted my friends that I was about to to get on the elevator and that they should call it up to their floor. My friends didn’t reply, so I got on the elevator and rode it all the way up and all the way down, without stopping on my friends’ floor. When I reached ground level I took out my phone to call them. And then another guest stepped on. And…. 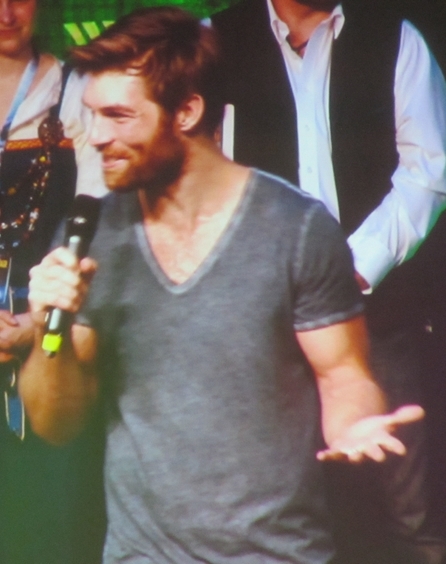 Liam McIntyre. Right from the gym! I was so startled, that I put my phone away again. I admit I was also still in a “OMG ALL THINGS Sam” haze, that even though Liam was standing right there half naked (well, ok, he wore shorts and muscle shirt *g*) and sweaty I wasn’t freaking out or fangirling or anything. My brain obviously needed a moment to actually register that moment and then the elevator ride was over rather quickly, before it could have turned awkward. The other fan got off at the 3rd floor and my friends finally had noticed I had been trying to reach them so they had called the elevator to their floor. The door opened, I saw my friend standing there, got off quickly and went directly to their room. My friend on the other hand did a double take on seeing my elevator company, started giggling, turned to their room and then back to the elevator as to make sure it was really him. She said “Hi” and Liam replied with “Guten Abend” (Good evening in German) and the absurdity of this moment sent her into a giggling fit. In which we joined her, when she came back to the room telling us about it. We still giggle about it now weeks later if any of us mentions it. Because it was Liam Freaking McIntrye riding in my elevator. And it got better. In a way. Because later that night I tweeted this. There were a few replies. Like this one… OMG! I mean, how adorable are those guys? Really! I heart them both quite a lot! And it was those small encounters there at RingCon and online afterwards that will make me keep this weekend in very very good memory.